NOTE: This book is available on Amazon.com. Let me know if you have any questions about the book. Good day, Mr. Tenzin Yeshi! I'm a postgraduate student at Center for Asian Studies of Russian Academy of Sciences (Moscow). I'm working on my Ph.D. Thesis about Tibetan refugees in India, USA and Europe. 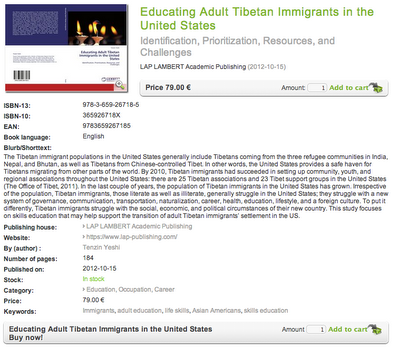 Your book is very important for creating coherent picture of life of tibetans in exile. But your book is very expensive to me. Help me, if it possible, to get acquainted with the materials of your work or tell me how can I get access to the electronic version of the book? I promise that I will refer to your published work when quoting.